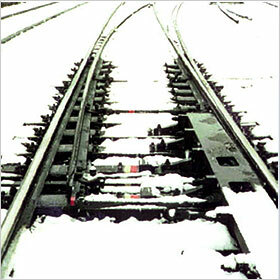 Installing the device directly in the rail and the point floorboard, it melts the snow, with the heat of electricity (separate main point power source). When it compares with the snow removal work due to the human strength, which uses the conventional shovel, the inconveniences etc., which installs the lantern, there is no burden for worker on the site.Again, construction expenses can also be reduced substantially since they are fitted up simply with exclusive use of metal fitting. The snow melting can be done unattended! Establishment cost About 1/2 of previous shapes.